Dominican Republic is the most beautiful maritime paradise in the Caribbean. Paradisiac beaches, coconuts, warm and crystalline waters… Along its 1,775 kilometers of coast, the so-called “Caribbean giant”, you can visit exceptional places. WannaBoats.com gives you the possibility to book an excursion with your friends or family, or if you want a unique experience, you can rent a private boat with a professional crew that will take you to discover the secret places of the Dominican Republic. In this guide, we help you choose the best excursion or private boat tour according to your lodging area. 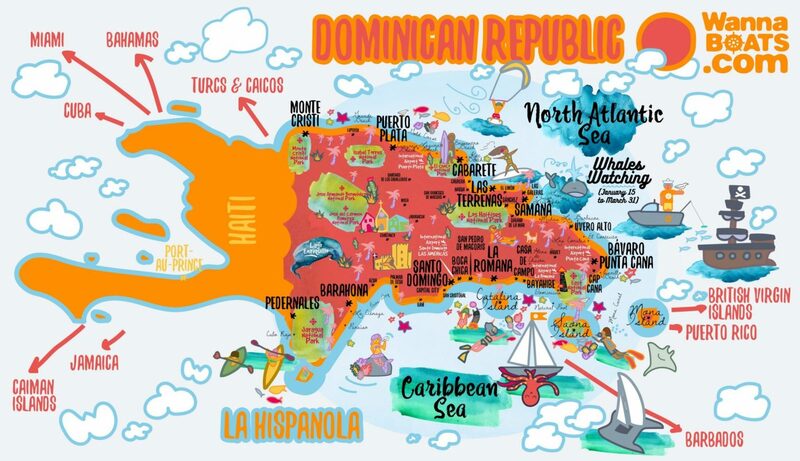 The Dominican Republic (in Spanish: República Dominicana) is a sovereign state occupying the eastern five-eighths of the island of Hispaniola, in the Caribbean region, and is the second largest and most diverse Caribbean country, situated just two hours south of Miami, less than four hours from New York and eight hours from most European cities. Known for our warm and hospitable people, Dominican Republic is a destination like no other, featuring astounding nature, intriguing history and rich culture. Surrounded by the Atlantic Ocean on the north and the Caribbean Sea on the south, our lush tropical island paradise boasts nearly 1,000 miles (1,609 km) of coastline, 250 miles (402 km) of the world’s top beaches, magnificent resorts and hotels, and a variety of sports, recreation and entertainment options. The Dominican Republic is the most visited destination in the Caribbean. The year-round golf courses are among the top attractions on the island. Christopher Columbus landed on the Hispaniola on December 5, 1492, which the Taíno people had inhabited since the 7th century. The island became the site of the first permanent European settlement in the Americas; and the oldest continuously inhabited city and the first seat of the Spanish colonial rule in the New World. The country overflows with fascinating history, museums and exciting cultural experiences like music, art and festivals, plus uniquely Dominican specialties such as cigars, rum, chocolate, coffee, merengue, amber and larimar. A geographically diverse nation, the Dominican Republic is home to both the Caribbean’s tallest mountain peak, Pico Duarte, as the Caribbean’s largest lake and point of lowest elevation, Lake Enriquillo. The island has an average temperature of 26 °C (78.8 °F) and great climatic and biological diversity. The country is also the site of the first cathedral, castle, monastery, and fortress built in all of the Americas, located in Santo Domingo’s Colonial Zone, an area declared as a World Heritage Site by UNESCO. Music and sport are of great importance in the Dominican culture, with Merengue and Bachata as the national dance and music, and baseball as the favorite sport. Taxis can be found at airports and hotels and can also be arranged in advance. Inter-city taxis cost RD$200. Various companies including several world brands offer their services at the main airports, tourist destinations and towns. Concho cars or shared taxis are very similar to “guaguas” because they travel specific routes and stop at points requested by the passengers.Fares are usually RD$25 for the routes in which up to six passengers will be boarded. Consider a private taxi for an inter-city route costs RD$200. Many young men in the Dominican Republic make a living by transporting passengers on their motorbikes. The service is used mostly for traveling relatively short distances. is the perfect place to begin a day of adventure, sailing in your yacht, touring the beautiful shores of the Dominican Republic, fishing and exploring the treasures of our island to return to our safe harbor, your home, Cap Cana. The staff is friendly and flexible; they are instructed in paying attention to detail to ensure that your holiday lives up to your dreams and that your yachting lifestyle is forever enhanced. Puntacana Resort & Club Marina is a legal port of entry for ships of national and international waters. It’s a full service marina. As a destination, Puntacana Resort & Club offers guests; world-class eateries, luxury hotels, real estate, watersports and more. The heart of Casa de Campo Resort and Villas’ ocean playground is the Marina. Inspired by the quaint seaside villages that dot the Mediterranean coastline, the Marina is more than just a place to moor, it’s an entire community for sport fishermen, yachting enthusiasts, and landlubbers alike. Browse the shops, dine under the stars overlooking luxury yachts and speedboats, and if the mood strikes you… With over 90,000 square meters, the Marina at Casa de Campo will give you plenty to see and do. Marina Casa de Campo is located in a privileged vantage point for water sports. Fishing is one of them. Within easy reach of Santo Domingo – only 12 miles to the west. The international airport, Las Americas, is just 7 miles to the west and has daily flights to most countries. The Marina has 150 well designed new slips. All slips have fingers and ample cleats to secure. The slips also have water (free) and electric (30/50 and 100 amps). WiFi is free at the Marina, or if you don’t have a laptop the internet can be utilized through a computer in the front office set aside for your use. Puerto Bahia is a full service marina in the north end of Samana Bay, in Dominican Republic. Samana is widely known as the top cruising ground of the Dominican Republic. Numerous secluded safe harbors, intimate caves, bountiful fishing grounds, great stretches of sandy beaches, and other alluring destinations invite exploration and offer memorable days of pure pleasure. Ocean World is located on Cofresi beach, near town of Puerto Plata. With an abundance of hotel rooms and recreation opportunities that include, golf, fishing, scuba diving, horseback riding, and even white water rafting, Puerto Plata is already celebrated as an affordable Caribbean vacation playground. Puerto Plata’s airport (POP) is a 30 minute drive, and has daily flights from Miami, NYC and cities in Europe. Ocean World Marina, now the only full-service marina located between the heavily traveled Florida/Bahamas area and the Puerto Rico/Eastern Caribbean region. Is 30 minutes from the capital city of Santo Domingo and very close to the tourist areas of Boca Chica and Juan Dolio. Also known as Joaquín Balaguer International Airport, to the north of Santo Domingo handles mostly domestic flights and flights to Haiti. Is only 15 minutes from the Punta Cana and Cap Cana area. This is the Caribbean airport with the largest diversity of flights from all around the world. Seaside resorts are a 10 to 40-minute drive from the airport. Also known as Puerto Plata International Airport, is only 20 minutes from the north coast city of Puerto Plata and neighboring tourist destinations like Sosúa and Cabarete. Also known as Casa de Campo International Airport, is just 10 minutes from Casa de Campo Resort and only 20 minutes from Bayahibe. Also known as the Juan Bosch International Airport, is half an hour from the city of Samana and 45 minutes to the destinations of Las Terrenas. Is 15 minutes from the bustling city of Santiago, and provides easy access to the nearby cities of La Vega, Jarabacoa, Constanza, San Francisco de Macorís and Moca. Is located at the entrance of Barahona city. 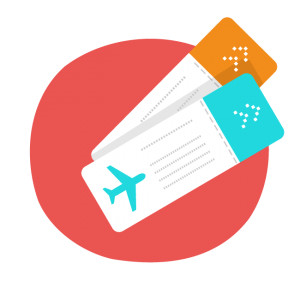 It receives mainly domestic flights.